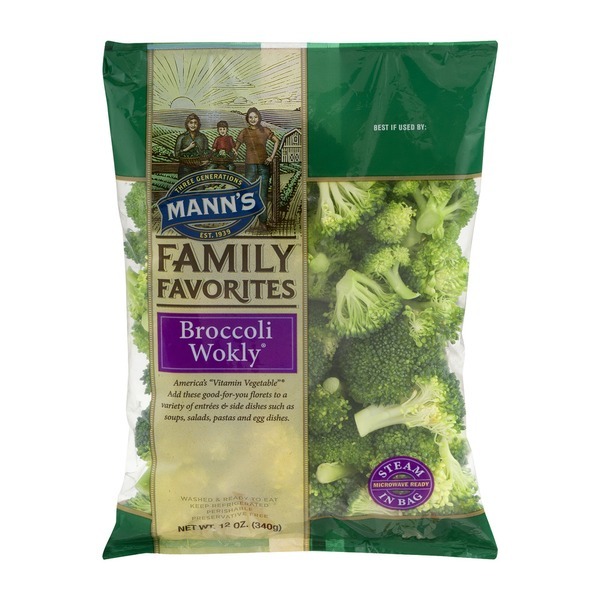 Mann's™ Family favorites Broccoli Wokly®. Three generations. Est. 1939. America's "Vitamin Vegetable"® add these good - for-you florets to a variety of entrees & side dishes such as soups, salads, pastas and egg dishes. Washed & ready to eat. Preservative free. Microwave ready. Steam in bag. Keep refrigerated. Perishable. Healthy cooking made easy! Steaming is a healthy & convenient way to prepare fresh vegetables. Our innovative packaging allows you to steam these veggies in your microwave. Do not pierce bag. Place this side up, in microwave & heat for 3 to 3 1/2 minutes. Remove carefully as bag will be warm to the touch. Toss in some freshness! Steam broccoli; chop finely and sprinkle over nachos, pizza, scrambled eggs or cheesy pasta. Steam on the stove top using chicken or vegetable broth versus water for more flavor. Saute using fresh herbs and olive oil.